We are going to visit Sixth Street as it was during much of the 1900's. We are going to begin at the western end and travel east. At the western end of 6th Street we have, depending on the time frame, three landmarks. A school, a hospital/nurses home, and the "Tripartite bridge to West Eighth Street" or the "Sixth Street Viaduct." At the far eastern end of E 6th street we have "Sixth Street Hill" what was once considered to be the steepest street in America. That will be covered more in the final part. The above map is a Sanborn Fire Insurance map of 1923. it shows the 400 block of W 6th street. It makes a good reference for what we are presenting here. Monroe Street is on the right. 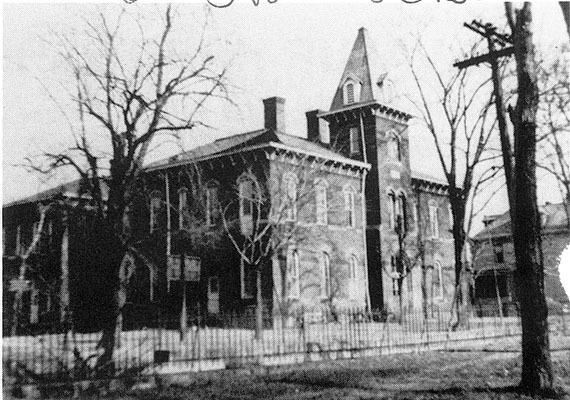 West Alley runs along side the school and the hospital..
Sixth Street School occupied the Northwest corner of West Alley and 6th street from 1880 -1956. 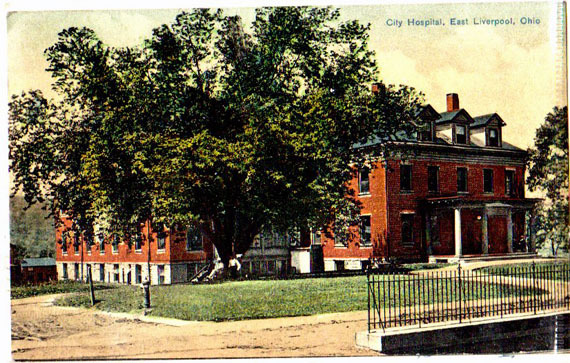 On the Southwest corner of W Sixth Street we find City hospital and what eventually became the nurses home. It occupied that space from around 1904 to 1960. 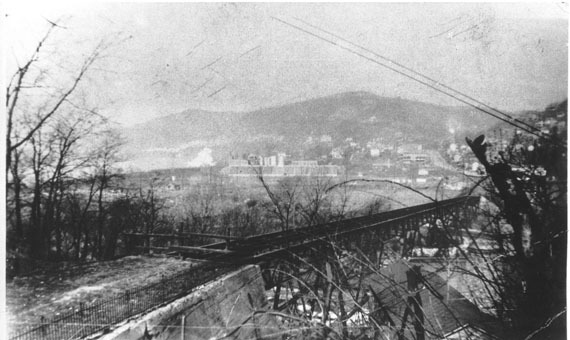 In the middle between the hospital and the school was the Sixth Street Viaduct. If was located there from 1906 to 1940. Let's begin our walk along 6th Street. From the West End looking upward towards town you see Sixth Street School on the left, the Sixth Street Viaduct in the middle and the hospital on the right. 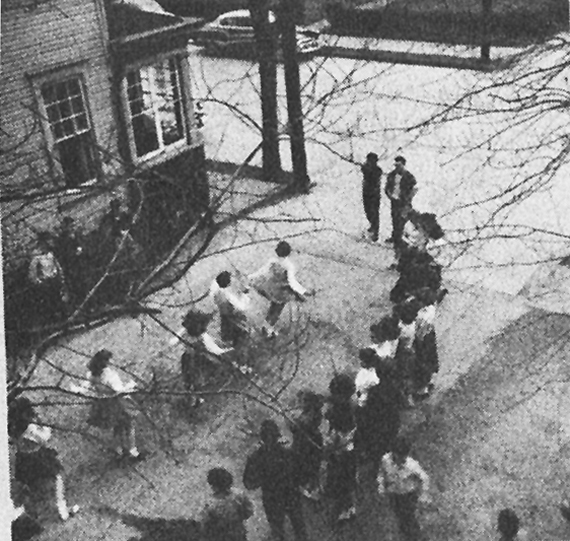 This picture may have been taken from the second floor of Sixth Street School. Sixth street and West Alley along side the playground of 6th Street School. Cheerleader practice. 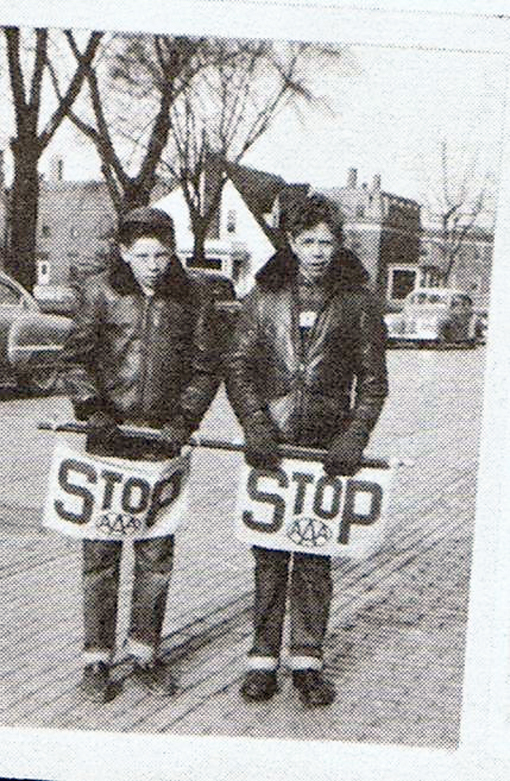 The mid 1950's. 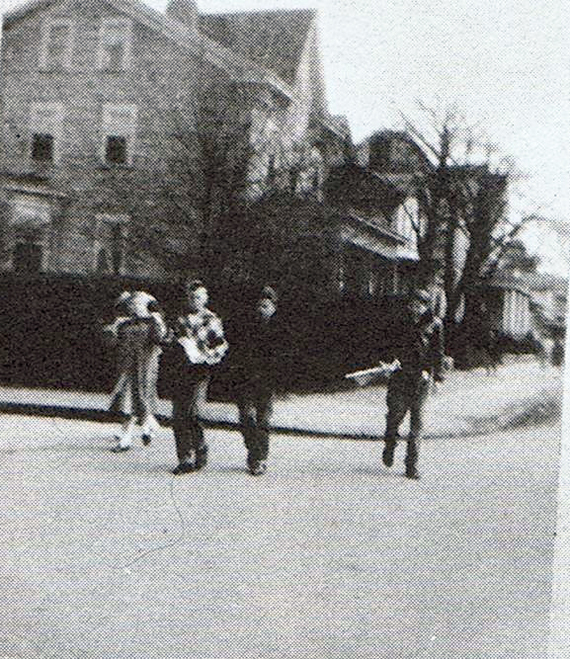 Our thanks to Nancy Wetzel for allowing us to scan from her collection of 6th Street School Yearbooks. A slightly different view of W 6th Street and West Alley. From the 6th Street School Yearbooks. Looking west down W 6th street. 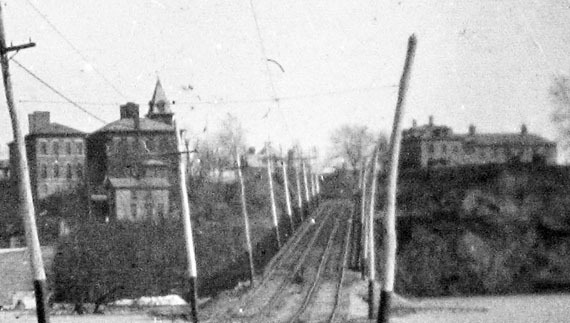 In the background you can see the City Hospital and Dr. Gerace's house on the left. The picture was taken in the 1950's from a little west of Monroe Street. From the 6th Street School Yearbooks. Looking east from the corner of Monroe Street and W 6th street. Kids on their way to 6th Street School. From the 6th Street School Yearbooks. The above map is a Sanborn Fire Insurance map of 1923. 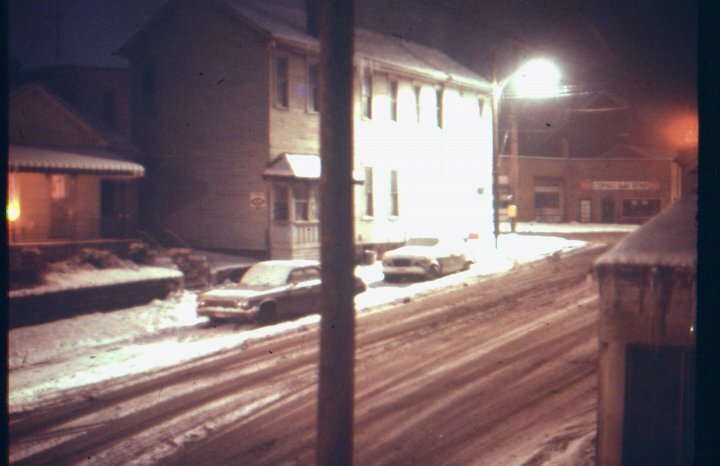 It shows the 300 block of W 6th Street. Monroe Street is on the right. Jefferson Street is on the left. A Hans Hacker Drawing. This shows the building on the NW corner of Jefferson and W 6th street. Chuck Capwell, ELHS Class of 1961 volunteered this info about this picture. 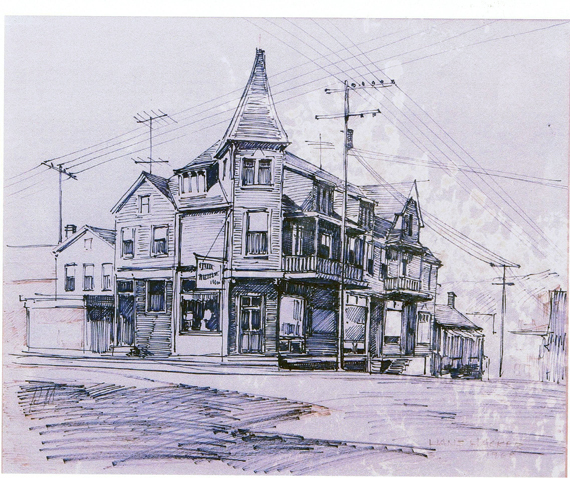 "It was situated on the NW corner of 6th street and Jefferson. In the 1950's it was occupied by Chuck Fluno's confectionary. Directly across from Mary's Confectionary on the NE corner. 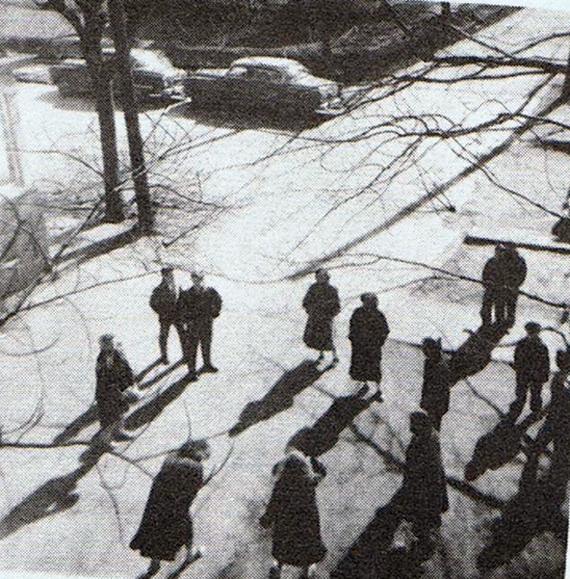 The set up steps on the right side of the photo (on Jefferson St.) led to the home of Mr. & Mrs. Ralph Johnson, a onetime band director of ELHS. He and his wife gave music lessons to hundreds of children. I personally took piano from Mrs. Johnson and trumpet and drums from Mr. Johnson." Showing the east side of Jefferson St and 6th Street. 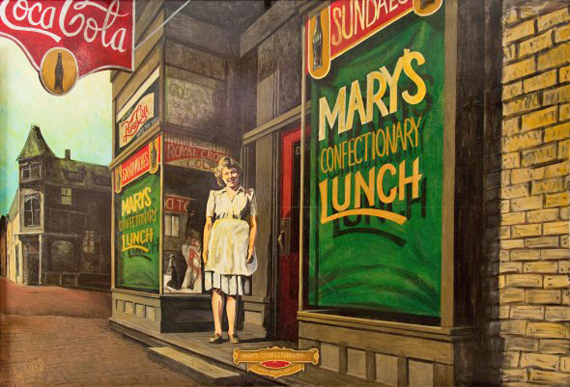 Mary's Confectionary was located in the building on the Northeast corner of West 6th street in the 50s. Originally posted on the Facebook "Memories of East Liverpool, Ohio" site by Melvin Paul Watson. Mary’s Confectionary, E. Liverpool, OH. © Craig Wetzel, All Rights Reserved. Posted with Permission. Southwest corner of Jefferson St and W 6th street. The above map is a Sanborn Fire Insurance map of 1923. It shows the 200 block of W 6th Street. Jackson Street is on the left Jefferson Street is on the right. At present we only have one picture showing anything in the 200 block of W 6th. That one picture is of the Ikirt House at the end of the block. The home of Dr. George P. Ikirt. The southwest corner of Jackson Street and 6th. 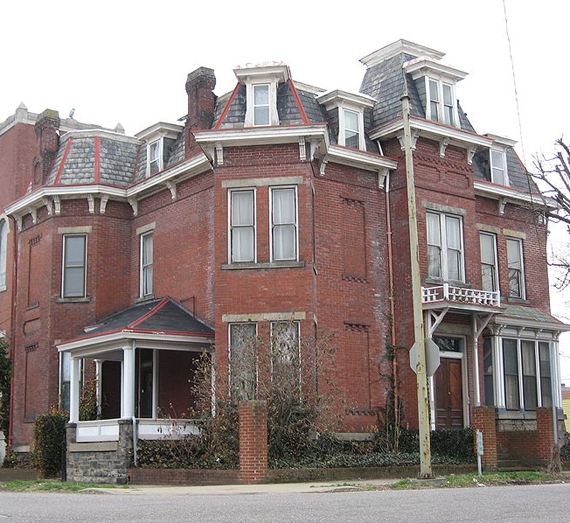 The House was built in 1886.